Emo Verkerk (1955, Amsterdam) is a painter, engraver, sculptor and photographer. He lived and worked in Bergen (1980), Amsterdam (1981-1991), Paris (1986), United States (1987), and since 2000 in Den Helder. He studied philosophy at the VU (Vrije Universiteit), Amsterdam from 1974 to 1976, and received his arts education at Ateliers ’63, Haarlem. He was a teacher at the Rijksacademie van... Read moreEmo Verkerk (1955, Amsterdam) is a painter, engraver, sculptor and photographer. He lived and worked in Bergen (1980), Amsterdam (1981-1991), Paris (1986), United States (1987), and since 2000 in Den Helder. He studied philosophy at the VU (Vrije Universiteit), Amsterdam from 1974 to 1976, and received his arts education at Ateliers ’63, Haarlem. 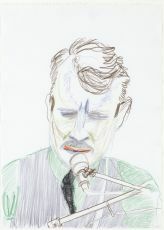 He was a teacher at the Rijksacademie van beeldende kunsten Amsterdam from 1991 to 2000. In 1978 Verkerk started painting and sculpting. At the beginning of his career he painted portraits of writers, musicians and visual artists he admired. He had many exhibitions, e.g. a large special exhibition at the Stedelijk Museum Amsterdam in 1988 and an exhibition at the Gemeentemuseum in The Hague in 2014. As a sculptor he produced among others Sperwer (Sparrow hawk) in 1995, belonging to the Sokkelplan in The Hague. 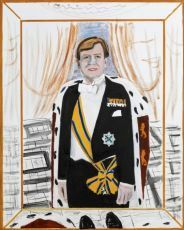 Verkerk obtained several awards, the Buning Brongers award (1980), Koninklijke subsidie voor vrije schilderkunst (Royal subsidy for free-hand painting) (1981), the Hendrik de Vries stipendium (1993), the Thérèse van Duyl-Schwarze award (2000), the Jeanne Oosting award award (2010).